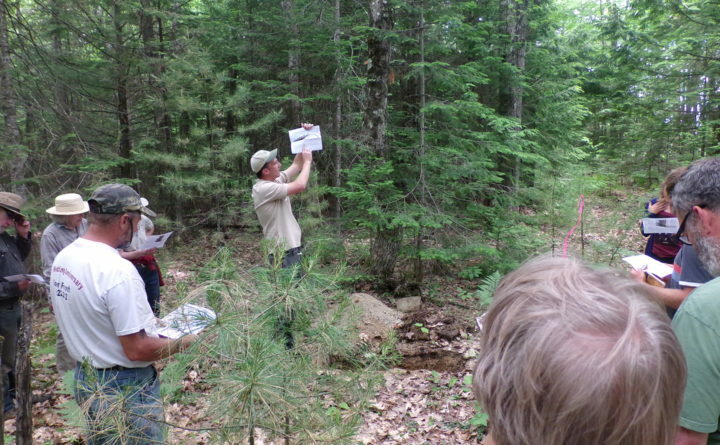 It is not uncommon for landowners in Piscataquis County to own several acres of woodland. There are a variety of options for these residents to manage their woodlots and over the years, the Piscataquis County Soil and Water Conservation District has worked to provide educational programming on techniques and practices that can be used to better and profit from their woodlots. We are excited to be offering our Low Impact Forestry Workshop at the Law Farm public land, offering yet another informative workshop to help landowners better manage their woodlots. The Low Impact Forestry workshop will be held on Thursday, June 28th and run from 9AM-3:30PM. This workshop will instruct attendees how to assess their forest, understand impacts from past activities and use that information to develop a basic management plan. There will be a morning session covering a variety of topics, including the importance of understanding the relationship between soils found in a woodlot and tree species that grow or are best adapted for the site. Additionally, presenters will discuss tree species, siviculture, sustainable forest management and more. During the afternoon session, presenters will walk the property with participants and discuss specific examples of management happening on the property. Much of this program will take place in the woods, gaining first-hand perspectives on topics discussed. The Low Impact Forestry workshop will be taught by a dynamic team of foresters, landowners, loggers and natural resource experts including David Rocque, Maine State Soil Scientist, Andrew Shultz, Maine Forest Service, Adam Cates, Maine Forest Service and Gordon Moore, forester. Participants will come away from this course with information on how to sustainably manage their woodlots. This workshop is a great option for small farmers, homesteaders and landowners looking to better utilize their woodlots. Whether you have an acre or 100 acres, there is something to be learned at this workshop. Pre-registration is required to attend and there is a $10 registration fee. To register or for more information, contact the Piscataquis County Soil and Water Conservation District at (207) 564-2321 extension 3, info@piscataquisswcd.org, www.piscataquisswcd.org.